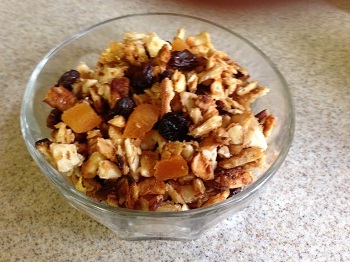 I was a little hesitant about trying to make granola out of matzo. If you’ve ever tried one of those Passover cold cereals you’ll understand! But there’s a new product out this year called Matzola, a granola-like snack. I had a sample at a women’s event a few weeks ago and it’s very tasty. Only problem is it costs about $7 for a small can. So I went online to look for a recipe for Passover granola and found this one that originally appeared in the Los Angeles Times. It’s very nice mixed with yogurt for breakfast — and it’s also a tasty snack! Heat the oven to 325 degrees. Line a baking sheet with parchment paper. Add the raisins and apricots and toss well. Transfer to a platter and cool completely. (It will seem a little “wet” when it comes out of the oven, but it gets more solid as it cools.) Store in an airtight container.